Occurs throughout southeast England to south Yorkshire with most records east of a line from Scarborough to the Severn estuary. Records from further north, Wales and the west country are mostly coastal and the species occurs on Man, Anglesea, Lundy and Wight. There are old records from Cumbria and more recently from Durham but it seems not to occur in Scotland (Luff). Generally described as abundant (eg Luff, 1999, 2007, Lindroth, 1974) this is a species of open,dry habitats; wasteland, grassland, arable fields and coastal sand dunes, usually found among vegetation on which the adults climb during warm weather. Through the winter and early spring they may be found under debris or among grass tussocks and often in large numbers. 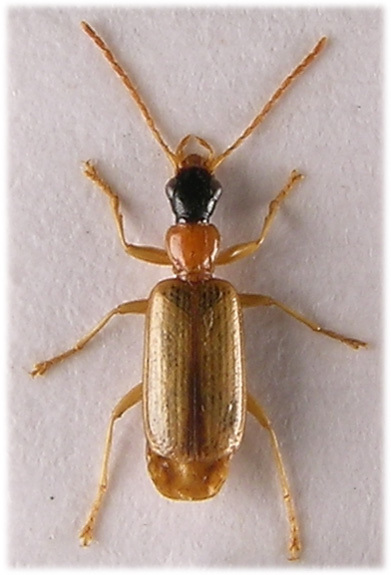 During the 1970's and 1980's the species the species was abundant in west London (Hayes, Cowley, Uxbridge, Harefield); through the winter large groups, often containing many individuals of Anchomenus (=Agonum) dorsalis Pp., were often found under debris bordering farmland in Hayes and Denham. Through the spring aggregations were common on nettles and docks in bright sunshine in the same situations, by the summer these had usually disappeared and the adults were likely to be found in any situation. Similar observations are recorded by Whitehead (1992) who found 15-20 beetles in individual grass tussocks and estimated a population to be not less than 500 on some 90m² of 'rank grassland' during October. Adults fly readily and are attracted to MV light (Lane and Mann, 2006), they are also considered valuable predators on arable land, climbing stems at night to feed (Luff, 1999). With such considerations in mind and knowing south Herts to be among an abundance of records it is curious that we find this species only very occasionally (2005-2008) in the Watford area. 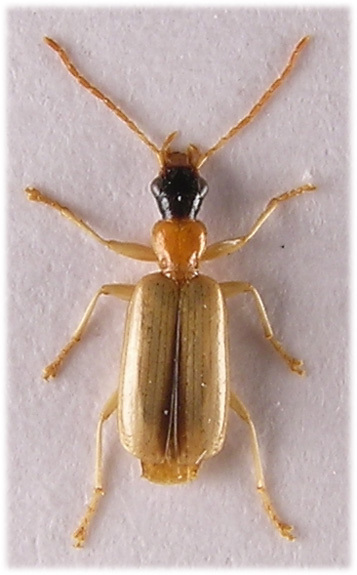 (Incidentally Anchomenus dorsalis, which was formerly very common in neighbouring Hillingdon, has not yet been found locally). A few single specimens have been found by sweeping nettles and long grass in the spring and summer but we have failed to find the species in winter. Two forays were undertaken during May and August 2008 specifically to find this species and much sweeping was carried out through Cassiobury park, Whippendell wood and around the adjoining farmland but only a single specimen was found; may 4th Cassiobury park. The species is a spring breeder (Luff, 1999) which may go some way to explaining some of our observations but perhaps not that of Whitehead (ibid). Sweeping vegetation in open habitats is probably the best way to record the species. 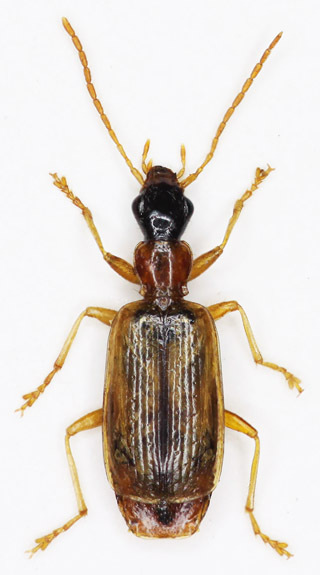 Although with a little experience D.atricapillus is instantly recognised there are several beetles with which it may be mistaken; the carabid genera Dromius and Paradromius, especially P.linearis (Ol.) which is an often abundant grassland species, are similar but lack the bilobed tarsal segment, and some smaller members of the Cantharidae are superficially similar but in all cases lack the protibial notch. 4.5-5.6mm. A narrow and flattened species with a relatively small pronotum and large head. Head shiny black, distinctly wrinkled inside and in front of large and prominent eyes. Temples long and tapering, distinctly pubescent. Two long setae beside eyes. Mouthparts, including clypeus and labrum, testaceous. Antennae entirely testaceous. Pronotum orange, cordate and strongly sinuate before hind angles which are in front of a straight basal margin. Distinctly margined laterally and with a deep pit inside angles. Surface finely transversely wrinkled and with a few very fine punctures. Elytra glabrous, parallel sided with broad, evenly rounded shoulders. Testaceous with suture and usually an ill defined triangular mark around scutellum darker. Each with seven fine striae and an eighth represented by a series of punctures within the lateral borders. At least some interstices with a single row of larger punctures although some of these may adjoin striae. Apex weakly sinuate and oblique, leaving last abdominal tergite exposed. Legs entirely testaceous, pro-tibiae strongly notched on inside before apex and all tibiae with small terminal spines on inside, otherwise without spines. Fourth segment of all tarsi strongly bilobed, claws with three teeth. Male protarsi weakly dilated. Whitehead, P.F. 1992. An unusual invertebrate habitat at Dumbleton, east Gloucestershire. Ent.Gazette 43:66.